Huge Clouds of Exhaust Smoke! A few days ago, I invited a petrol-head friend of mine to take my 2003 RX8 for a spin (I was with him). After about 5 minutes, while doing about 120kph, the car emitted a huge cloud of blue smoke. It was just one huge cloud, so big that it looked like we had blown the engine up. But the car still ran OK and didn't show any loss of power. 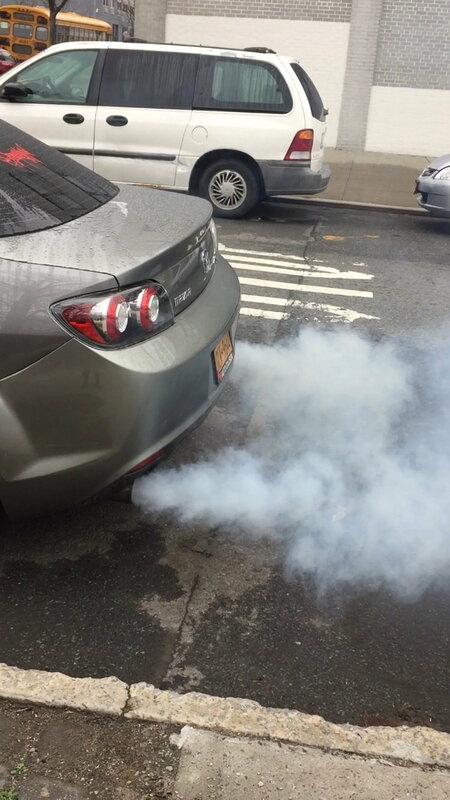 This phenomenon of a singe huge blue exhaust smoke cloud happened twice more - both times on engine start-up. But over the last 2 days, nothing like this has happened again. I have had the car in to the local Mazda dealership today and they couln't find anything wrong. The oil level is not over-full. They said they checked the oil metering pump and that was OK. Based on engine performance and the fact that the problem is no longer apparent, they don't see it as an oil seal issue. This is a very embarrasing thing to happen when driving a really cool car. Anyone have any ideas about what could be happening? Did you check your air filter? If you are not redlining your engine regularly you maybe just blowing off carbon deposits in your engine. The car also runs very rich at warm-ups, another possibility is that if you do a lot of short drives you may have accumulated a lot of carbon soot in the exhaust system and consequently blows them out in one big smoke cloud when you do rev it hard. What does the rotary gurus think? Last edited by wedge357; 07-06-2005 at 06:08 PM. Strange. Are you sure the smoke came out of the exhaust and not as a result of a leak onto the exhaust? No evidence of an oil leak anywhere? Had you topped up the oil recently? If the MOP had dumped in a large amount of oil, I'd have expected a CEL. The fact that it has happened twice at start-up may point to a leak......oil pooling after shutdown. You weren't cornering when the smoke appeared the first time? Mine blew smoke really bad, enough to fill the street on start up for about a week until the check engine light finally come on. I took it in and they found the O2 sensor #2 was bad. Replaced it and alls well. But like I said for the few days there was no check engine light I was wonder if it was normal, but it was a lot of smoke, went away mostly when warm unless I reved the motor high. This is what came to my mind as well. Some owners have reported finding oil pooled in the air-cleaner box or intake (I forget what caused this). For the car to give one belch of blue smoke while cruising, it could have suddenly ingested some of this residual oil. Doesn't sound like an external leak since you also got smoke at startup, when the exhaust would be cool. i believe the oil in the airfilter box is a result of over filling the oil. Thanks everyone for your thoughts. I had my RX8 out yesteday driving around some particularly fabulous sports car roads with some other guys who have MX5s (Miatas). My car backfired 3 times within a perod of about 10 minutes - those behind said it looked spectacular with a big flame out of each pipe. The exhaust would have been fairly hot as we were were having a lot of fun and revs were pretty high. The nature of the winding road meant that I was on and off the accelerator a lot. Then we stopped to regroup and when I re-started the engine, lo and behold - another big cloud of blue smoke. So, my question is could the backfiring be a clue to the cause of these mysterious and intermittent blue clouds? Blue smoke is generally associated with burning oil. Backfiring and flames are from unburned hydrocarbons getting combusted in the exhaust system. I suppose that could be either gas OR oil, or both. If I had to guess I'd say that the excess oil getting into your combustion chambers is fouling the plugs -- causing an intermittent misfire and the resulting unburnt gas then backfires and flames out your tailpipe. There are only 2 ways for oil to enter the combustion chamber -- through the intake ports or past the seals. In reply to Gomez's questions, yes, the smoke did come out of the exhaust, but there is no sign of any oil leaking onto the gound beneath the car. Also I haven't topped up the oil recently - its currently at about half on the dip stick and doesn't seem to be going down very fast. I have noticed though that the engine compatment seems to be covered in a light oil film. I have never seen this in any other car that I have had, but then I have never had a rotary before. When the smoke appeared first time, we were giving the car a bit of stick and had just completed some heavy braking followed by acceleration and then a reasonably high speed corner. With regard to the exhaust system, I think it is standard but I couldn't say for sure. In NZ, its not uncommon for people to rip the cat out to reduce exhauset restriction. Maybe I need to get underneath and check this out. It's not new, its a 2003 model with 10,000km on the clock. Nubo thinks it could be oil leaking past the seals (horrors) but if that is the case, then wouldn't it be smoking all of the time rather than just a big cloud every now and then? I would start with the spark plugs. The previous owner may have had a flooding issue, and the plugs may be fouled. That could explain the backfires & smoke. Start with the simple stuff & work from there. So let me get this straight. You're a Kiwi who bought a second hand RX-8 with 10000km on the clock......previous history unknown. Correct? Details such as where you live are important in eliminating some possible causes, different markets have different problems. How long have you had the car, has this problem just showed up after six months of ownership? Was the car originally sold new in NZ, or is it a ex-JDM import? The light oil film under the bonnet sounds like the detailing goop some car yards spray to shine the engine bay up. Was the car purchased privately, or from a yard? And my last question...........is the car still under warranty? If it is, take it back and have the dealer run his eye over it. You have a problem. The car is a Jap import and I have had it about 4 months. I am the first NZ owner. I am not sure taking back to the yard I bought it from would be much use. Those guys might know a fair bit about importing and selling Jap cars but I wouldn't be happy about them fiddling with it. I would rather take to a Mazda dealer's workshop - which I have already done. The Mazda mechanic couldn't find anything wrong with the car. Last edited by Manhattangray; 04-09-2015 at 10:44 AM. It might be a coolant seal failure. Get your cooling system pressure tested. Bump....a similar event occurred while driving my 05, AT today and thankfully this thread calmed my nerves. Took the car out for a spin this morning on a great section of quiet, hilly road in Western Washington. The sun was ACTUALLY out. After about 5 minutes of really fun uphill Zoom-Zoom, I felt a misfire and looked into the rear view mirror and saw this really voluminous cloud of blue smoke behind me. I let off the throttle, but it clearly was still burning LOTS of oil. This continued for another minute of so. Since the engine recently passed 130,000 I thought it's time had finally come and I assumed I had blown an oil seal of some sort. The smoke cloud was HUGE......Over the next few minutes the smoke diminished and my confidence was restored enough to have another hour of fun, but it did shake my confidence. Last edited by StarSpinner; 03-05-2016 at 03:30 PM. Quick Reply: Huge Clouds of Exhaust Smoke!